Abstract : We present Histomages, a new interaction model for image editing that considers histogram views as spatial rearrangements of image pixels. 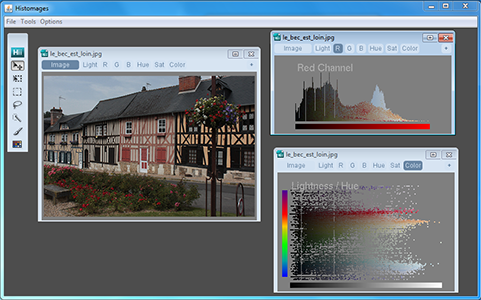 Users can select pixels on image histograms as they would select image regions and directly manipulate them to adjust their colors. Histomages are affected by other image tools such as paintbrushes. We explore some possibilities offered by this interaction model, and discuss the four key principles behind it as well as their implications for the design of feature-rich software in general.